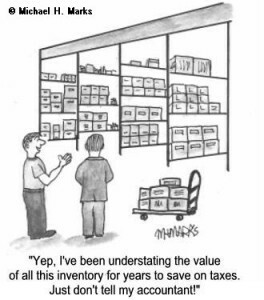 Business owners often report a lower inventory value to reduce the taxes. The logic is simple – when you report lower year-end inventory value, it implies that you have consumed more raw materials, your cost of goods is higher, and your profits and hence your taxes are lower. However, this short term gain could create a problem when you are about to sell this business. How will the inventory be valued in the Purchase Allocations? How will you convince the buyer to pay for the actual inventory value? And if they do, who is going to have to pay the taxes on the larger amount that the buyer will have to report? Not reporting the right inventory value is not only unethical, it is just not smart business. This entry was posted in Business Advice, business valuation, small business and tagged business advice, inventory, selling business on October 7, 2016 by techblogger. Inventory Blues – Is Excess inventory Weighing you Down? Selling Your Business – Why Giving to Uncle Sam May be a Good Idea!